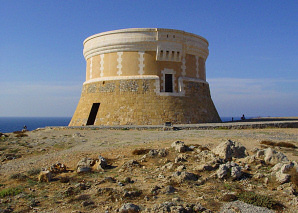 The Tower of Fornells, situated on the north of the Menorcan coast, is one of the largest defence towers on the island and was built during the English occupation, between 1801 and 1802, with the view to controlling and protecting the entry to the port of Fornells. For this reason it is situated on a high point with excellent views and its shape is strengthened, as if it were a small impregnable castle. The building has a truncated cone shape and is made of stone, mortar and sand stone reinforcements. You can reach the place by foot from the village of Fornells and the inside can be visited during the summer from 11 a.m. to 2 p.m. and from 5 to 8 p.m., except on Mondays and Sundays. The price of the entrance ticket is 2,40 euros. More information: The Torre de Fornells, the defence of an island.